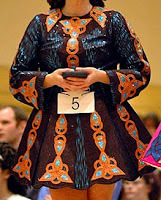 Using the Feisdress pattern, Susan and I each made a panel dress for the SRO. 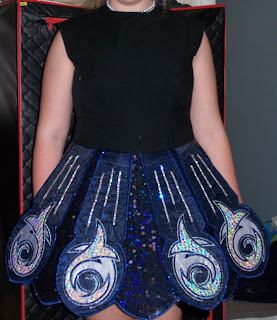 You can see both below: I made my daughter’s black/dark blue dress (Susan’s design), Susan made the black/copper/teal dress for our webmaster (her design, I did the embroidery). Folks have asked for instructions for the panel dress…here I will post what we did…use what you will. This was written by Susan and I, and we are assuming you are familiar with/using the Feisdress pattern. Susan’s instructions for what she did with the Webmaster’s dress will be in bold type; mine will be in regular type and parentheses. Please feel free to post questions if you have them. Important note: Susan and I split the Feisdress skirt pattern into 5 pieces as opposed to the usual 3 – we separated the front side panel (FSP) and half the side tuck from the back skirt and the other half of the tuck. 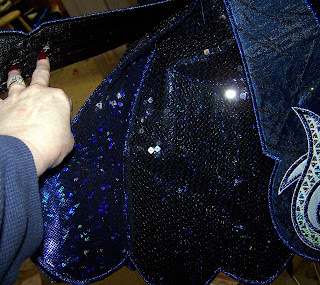 And, most importantly, we attached the skirt lining to all pieces of the underskirt (as we called the skirt under the panels) BEFORE we attached the panels. When attaching the panels, the stitching went all the way through the lining. 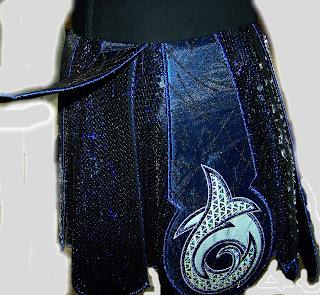 1) Susan: Make your 3-panel, knife pleated skirt as usual. Here is Webmaster’s skirt with the three sections clamped into place. 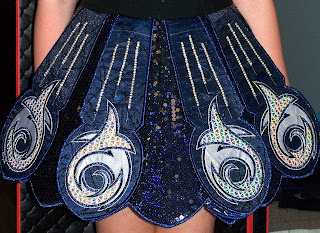 This is the outside of the skirt. The fabric showing will appear to be the pleat lining in the finished skirt. The skirt pieces have been stiffened and lined, but the bottom has not yet been shaped (you can see the markings). Since this dress will have a back skirt made of a different fabric, there will be a seam in the side tuck (right FSP shown here with panel attached and hem finished). Here’s the right FSP and half tuck with the right back skirt and the other half of the tuck. This is the back right side of the dress before complete construction. This pic is of the front pleat. The panel was sewn down to the edge of the front panel…you can see the panel overlap. This is the back pleat…easier to see because the panel is free. Here you can see how loose the back panels are. 2) We used 4 panels on the front. Both of us used the offset skirt (front skirt side seam that falls forward of the bodice side seam). To determine the width of the top of each panel, measure from front side seam to front side seam (offset skirt or full front). If you want 4 panels divide this by 4; 5 panels, divide by 5. This gives you the width of the panel at the waist seam. You of course must then decide what shape the panel will be above the seam taking into consideration the seam allowance. The Feisdress pattern allows for a 2 inch seam allowance at the waist for let-down. Continuing the angle of the panel into the seam allowance means there will be overlap. Angling it so there is no overlap obviously affects the shape at the top when the skirt is let down. Susan cut her panels so that they met at the waist seam on the Webmaster’s dress. I wanted space between my panels so measured that into the mix. 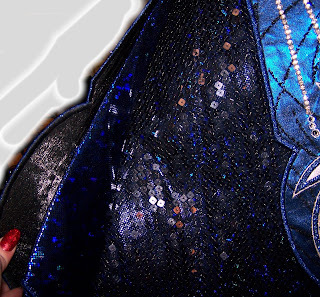 You can see the basted stitches at the seam line on Susan’s dress here. Here you can see the spaces on mine (the pic is off center so does not show even spacing). For the width of the bottom of the panel, measure the bottom of the front skirt, decide how much of the underskirt you want to show, subtract that from the bottom skirt front width, then divide by 4 (or 5). Construct panel accordingly. 3) Susan: I decided not to shape the sides of the pleats on this dress. I thought it gave a more long-tall-lean look to the skirt. So the embroidered pieces are cut wide enough to wrap around and overlap in the back. Here is an embroidered panel. You can see the marked fold lines and the bottom shaping. Here is the panel with the Timtex fused into place. I serged one side and overlapped it in back. The panel is pressed over the Timtex. 4) Susan: The bottom shaping was carefully marked and cut. Then I opened up the fabric and satin stitched the edge with rayon thread and used fray-check. Once dry, I folded the fabric back around the Timtex and fused overlapping back pieces closed. Finally, the bottom was satin stitched with Super Twist thread (folded closed). This technique made nicely finished end corners. Now place panels on the skirt to mark the shape of the hem (whether you attach them for good now or not is up to you). Susan and I both made the main skirt a bit shorter than the panels and mirrored the panel shapes, but there are as many ways to do this as there are dressmakers! After shaping the hem and attaching the panels, sew the skirt pieces together at the tuck and front pleats and cover the seam as usual. 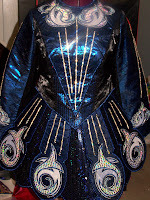 Since both of these dresses are 2 pieces, the skirts were then sewn to underbodices. I personally have become a convert to 2 piece dresses. I cannot imagine the trouble I would have had sewing all of this to my stiffened bodice. The cotton under bodice was much more forgiving. Oh, right. Yours was silk, Molly’s was broadcloth. Thanks for the correction, Madame!